Water damage can be devastating to your home or commercial building. It can not only total up to thousands worth of damage but also a great health risk. Excess water can damage your furniture and appliances and act as a great breeding ground for mold. Both of these are expensive dilemmas to fix. To prevent water damage in your future, it is recommended you be aware of these points of interest. Water damage can be the result of several possible causes. Leaky dishwashers, broken pipes, broken dishwasher hoses, leaky roofs, overflowing washing machines, clogged toilets, and foundation cracks can all lead to water invasion. Environmental conditions such as heavy snow and rain, floods can also lead to water damage. The effects of water damage can vary depending on its severity. For example, excess water can lead to minor problems or ultimate destruction of your home or building. As soon as you notice water buildup in areas of your home or building, start the water damage cleanup immediately. By taking action early, you dramatically increase the likelihood of saving your carpets, rugs, furniture, clothing, and other important items from becoming damaged. However, if you have noticed that the damage has become too severe or want a free consolidation, do not hesitate to call Hy-Pro for fast and friendly service. What Are The Categories Of Water Damage? Classification of water damage is separated into three categories and four classes. The class is especially important as you can be able to make a more educated guess on your repair options. The first category of water damage refers to clean water or water that does not pose a threat to humans. Some possible causes of this type of water damage include sink overflows or broken appliances. The second category refers to gray water or contaminated water. Contaminated water may cause sickness or diseases when ingested and contains microorganisms. Some possible causes of category two water damage include broken sump pumps, broken toilets, and seepage. The third or last category is referred to as black water. This type of water is extremely unsanitary and will cause sickness regardless of ingestion. Some possible causes of category three water damage include contamination of standing water or sewage problems. The first class of water damage is the least harmful. It is easy to fix and materials have a low absorption rate. However, class two has a fast rate of absorption. In class two, your furniture will likely be damaged. This makes water damage repair more difficult. Class three has the fastest rate of absorption. Class three water damage may be from broken sprinklers or other overhead sources. This soaks into your walls and furniture and is damaging to the foundation of your home. Class four is the most harmful of water damage. This type of damage may affect your concrete, plaster, and hardwood floors and requires special and professional removal procedures. If you need further information or require assistance with your water damage problems, do not hesitate to contact Hy-Pro for a free consolidation or request a fast and friendly service. What Are The Consequences Of Water Damage? You are most likely aware of the potential consequences of not addressing water damages immediately. Billions of dollars are invested into water damage prevention every year. A well-designed home or building is to prevent water damage but are also not optimal conditions for mold growth. Roofs, walls, doors, or windows cam become degraded over the years, which will be problematic in the years to come. This makes your home more prone to water damage and diffusion of harmful bacteria into the air. Water damage is also a primary source for structural and interior damage. In the event of a natural disaster such as storms and typhoons, water can not only enter your home but also cause damage to your home’s internal structure. This can lead to high-cost remediation and repairs. It is best to check your rooms or any areas that may be easily prone to water invasion after heavy rain or storms. This becomes a complex question if you look past the obvious answers. Many parameters are taken into consideration into understanding why homes or buildings leak. There are four main moisture transport mechanisms: liquid flow, capillary suction, air movement, and vapor diffusion. If you are finding that there are a significant number of water intrusions and mold conditions inside your home or building, one or more of these mechanisms is likely going to be responsible. Most leaks are found within what is called the “building envelope”. This includes doors, windows, roofing, walls, sealants, waterproofing, decks, grade, and below-grade conditions. If your home or building has not been properly assembled either by design or by application of critical components, leaks will frequently occur. What Are The Key Issues That Cause Water Damage? Some key problems that cause water damage are a poor choice of materials, poor detailing in the design of the building, sealants, and waterproofing. One key problem that causes water damage to your home comes before your home is built: the lack of attention on the initial design. Depending on your contractors and designers, they may pay little attention to structuring and building envelope waterproofing details and application practices. As waterproofing and sealants play a crucial role in maintaining the integrity of the building, these details should not be disregarded so lightly. The lack of attention to these details not only promote a false sense of security but will also lead to the majority of water intrusion issues. Another key problem that causes water damage is application practices. While many industries including the construction industry have undergone technological advancement in both materials and application, there has been a decline in expertise in the workforce. If products and materials are not properly applied based on industry standards or regulations, chances of your home suffering from water damage in the future are likely. As preventing your home from water damage is more dependent upon the application, the application error is often the predominant cause of water intrusion issues. Design and detailing of your home or building is a close second. How Do You Diagnose Leak Problems? Playing a guessing game with water intrusion is risky business as it endangers those involved and your wallet. While having a proper protocol and an experienced and quick access to a professional team is an effective way to stop water intrusion and their dangerous effects, you should have a general idea of how to properly diagnose your leak problems before calling. Multiple key factors have to be taken into consideration prior to diagnosing water intrusion issues. A clear understanding of the project plan of your home or building and specifications of the building. Background information about the leak location(s), including when and how it occurs. Knowledge of previous attempted repairs. An understanding of the transport mechanisms that lead to water intrusion. Diagnosing leaks may sound like a simple task. However, it requires extensive on-the-job training professions that develop and hone their skills to get their job done as efficiently and quickly as possible. First, a hypothesis is formed, where the general method by which the water is entering your home or building is identified. Following that comes the process of elimination. Sometimes more time is spent on finding what is not causing the problem rather than what is. Keep in mind that some leaks are easy to identify, while others require extensive time and effort to find and analyze their sources. Once you find a source of the leak, it is likely that there are others beyond your knowledge. It is often that you will find analysts examining and water-testing one location only to later discover that there are several sources adding onto this problem. However, if done in an orderly fashion, it is not uncommon to stop leaks the first time. In a nutshell, diagnosing leaks should always include inspection, testing, analysis of leak location(s), and the components or properties responsible for the issues. To get a better breakdown or idea of diagnosing water leakages, contact Hy-Pro for a free consolidation. Water damage restoration is the extensive process of restoring your property back to its original condition after suffering from any level of water damage. Water damage restoration is a multi-step process, and it should be handled by a certified, experienced, and licensed water restoration contractor. The first step to water damage restoration is visual inspection. A certified and professional water damage technician will first do an assessment to determine the appropriate and most effective action needed to reverse the negative effects caused. If there are no safety hazards or concerns, the restoration process will begin. After the initial inspection, the first priority of the technician should be containing the damage and extracting the excess water. All wet furniture including clothing, toys, and rugs are then removed from the surrounding area. After extraction, technicians will remove any wet surfaces such as floors, ceilings, or walls to speed the drying process. If a wet surface can be removed, it must be and treated appropriately. This includes large furniture such as cabinet drawers and doors to accelerate drying and reduce the chances of mold. After successful extraction and removal of all wet surfaces and materials, commercial grade equipment such as air movers, wood floor drying systems, heaters, and dehumidifiers are brought in to generate dry air and increase air circulation and evaporation. As humidity is a dangerous catalyst for mold growth, consider your drying surroundings carefully. Two to four days is the most common drying time period. However, this will vary due to damages were done and the materials impacted. Another inspection should be done by the technician to ensure that there are no hidden pockets of moisture. This can result in further water damage or act as a small breeding ground for mold which is definitely not ideal in your future. Reconstruction is the final step in water damage restoration. If any of your furniture or materials need to be replaced, do it at your earliest convenience. Get your home or building back to its healthy and pre-damaged state as soon as possible. What Are Tips to Water Damage Prevention? Initial water damage prevention is something you should be aware of. While most insurance policies cover basic water damage, why go through the process in the first place? Here are some tips to help you prevent future water damage in your home or commercial building. Be careful of where you plant your flowers and plants. Invasive roots will grow straight into your drainage field, pipes, sprinkler system, and septic tanks without your knowledge. Plan before you plants to keep those roots away from any water lines. Test your sump pumps regularly. Sump pumps are extremely active during storms or heavy rainfall. That is not the time when you want to realize yours is not doing its job. Check your sump pumps at least once a year. Ideally, perform several checks during heavy rainy seasons. Clean out your roof gutters. A clogged gutter can send water leaking through your home’s foundation such as the roof and down to your basement. Check your gutters for a buildup of leaves, birds’ nests, sticks, or any other small items that can find its way to your gutters. Next time you’re doing a seasonal cleaning, check your gutters to ensure that they are doing their job effectively. If need be, get a professional to check on them. Treat your drains with respect. Avoid pouring grease down your drains at all costs. There is no guarantee that grease buildup will be completely eliminated. Chances are that leftover grease will be still be stuck to your drain walls. Your safest option is to allow your grease to harden and toss it in your trash. Install a backwater valve. A backwater valve is a handy device that prevents sewage in an overloaded main sewage from flooding your basement. A properly installed valve will automatically close if there is sewage build-up from the main sewer and must be placed strategically so it effectively stops sewage backup. 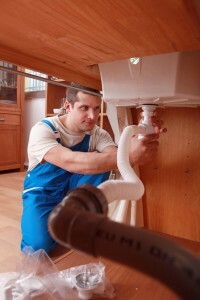 It is recommended that you install a backwater valve if your home does not have these features. If your home was built after 1979, it became the law to have backwater valves installed. Ensure that you maintain your backwater valve regularly by ensuring that you have access it to it at all times and removing any material that may prevent it from operating appropriately. Install a sump pit drainage system. A complete sump pit drainage system includes a sump pit, a sump pump, and a pump discharge pipe. The function of a sump pit is to collect water from your floor tiles. Then your sump pump will push the water outside your house through the discharge pipe. Your sump pump discharge pipe will drain the excess water into your lawn, flowerbed, or wherever you feel it’s appropriate. Keep in mind to not drain water onto sidewalks, boulevards, streets, neighboring properties, lanes, or into your home’s floor drain. This is illegal. Like the backwater valve, do checkups on your sump pumps and dischage pipes to ensure they are doing their job properly and to prevent buildup of debris. The smallest actions can often prevent a lot of damage in the long run. By keeping these tips in mind, you can keep money in your wallet, save future frustration, and buy more time. However, if you find that you need to talk to an experienced professional, call Hy-Pro to get a free consultation today! While the most obvious benefit in hiring a professional is saving you time and effort, they also come with extra benefits. Professionals will restore your home quickly and effectively. They will also educate you on what the issue was and how to prevent it in the future. All of your plumbing questions will also be answered immediately. They will also be knowledgeable in good products that will be an active part of your cleaning collection. The tools that you need will already be available to you. By familiarizing yourself with appropriate plumbing equipment, you can make an informed decision about purchasing these products in the future. Before hiring a professional, consider the extent of the damage and time necessary for you to perform a water restoration process. For experienced, fast, and reliable services, contact Hy-Pro Plumbing and Drain Cleaning today!